When the ore deposits were exhausted, the wood of the forests of the so called "Erzgebirge" became the most important raw material. Formatively, it influenced the region and guaranteed the people's living. The "Erzgebirge" is famous for its traditional art of woodcarving, toys and sports equipment in the whole world. The products and the history of the company Berlebach are also part of this successful trend. In 1898 the merchant Peter Otto Berlebach founded the now oldest tripod factory in Germany, situated not far away from the Saxon art and university town Dresden. It is even the only factory in the world which ever since has continuously been working at the development and the production of wooden tripods, as far as we know. Almost from the beginning Berlebach delivered its wooden tripods and other photo accessories abroad too. A fact which is verified in the "Hamburg Export-Handbuch" from 1906. Above all England was the most important exporting country. In 1918 the founder of the company, Otto Berlebach, retired and sold his business to three former employees of the camera factory Ernemann in Dresden. The new owners - Dittmar, Biskaborn and Heisinger, experienced specialists in the wood, metalworking and commercial sectors, brought in their large experiences in the field of photography. For many decades the firm was kept in private hands. Then in1972 it was nationalised and was run as the state owned company "Foto-Kino-Zubehör" (Photo-Cinema-Equipment). In those days the company manufactured the whole range of tripods including travel tripods of light weight as well as heavy tripods used in studios. This was for the entire GDR as well as for all the other countries of the Eastern bloc. In 1990 the factory was put under the surveillance of the Trust Institution. The transfer of old GDR-companies into private ownership presented the unique chance of a new beginning for Germany's "ancient" tripod factory in Mulda to continue in its well-tried, successful and traditional way. However, before achieving that goal, three long years of never-ending negotiations passed until the trust administration agreed to the transfer into private ownership literally at the very last minute. Wolfgang Fleischer - one of the company's executives since 1962 and today's owner of the company Berlebach - succeeded in protecting the enterprise from going bankrupt. He bought the ground, the production plants, and the name Berlebach from the Trust Institution. In July 1993 the production of the solid ash wood tripods started again. Essential investigations were made because a competitive production was only possible with new machines for wood- and metalworking. In 1994 the now privatised company Berlebach-Stativtechnik appeared on the international world-wide exhibition "photokina" for the first time and presented its latest range of newly developed and improved ash wood tripods. Much interest was shown in the Berlebach products and since then the world-wide export has been increasing continuously. Today they are delivered to more than 40 countries. 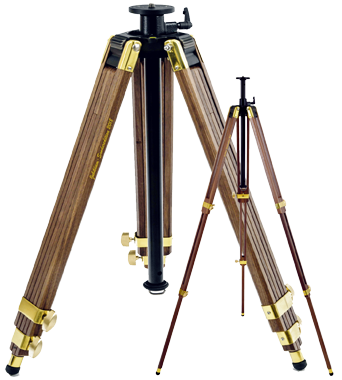 Berlebach ® Ash Wood Tripods - The Genuine Alternative!